When I attempt to login, the page just refreshes with empty login boxes? I'm not a member; how do I create an account to make a purchase? What is Agora's return/refund policy? How do I access my digital goods/ downloadable content to my computer? Will digital goods work on both Windows and Mac computers? I'm using a Mac, where is my seminar zip file? How do I delete or hide an item from my digial library? What is an in-person conference? What is an audio seminar? What is a web seminar? I'm a new practitioner. What AILA programs would be appropriate for me? How do I register for a conference / seminar / webcast? Can more than one person participate on the same connection? Can I order recordings of AILA conferences or seminars? When does an OnDemand program become available after it is recorded? How can I return a publication? Where can I find updates to published books? Is there a bulk-order discount for books? Where do I enter my promotional/coupon code? How can I contact AILA about my order? To login, go to agora.aila.org and click "Log In" in the upper right hand area. On the next screen enter your User ID and password into the login boxes and click the "Log In" button. Then click "Sign In" and the screen will refresh to replace the Log In link with "Welcome [your name]." Passwords are encrypted for security and can only be retrieved by individual users. To find out your current User ID click the link "Forgot User ID or Password" located above the login boxes. On the next page, enter your email address in the box and click "Retrieve User ID and Password" The system will automatically return both your User ID and password to you. If you have multiple email addresses, you must use the one that you have on file with AILA. If you do not see the email within 10 minutes, please check your SPAM folders. If you've waited and nothing is in your SPAM folder, please email webmaster@aila.org. To change your password click the link "My Account" located in the upper right hand corner of the page. Once on your account page click the link to "Change Your Password" located underneath your billing address. This will take you to a new screen where you will have to enter your current password and then your new password twice in order to make the changes. Remember that your InfoNet account includes personal information about you, so you should pick a strong password. A recommended secure password is one that is at least 6 characters long, includes both upper and lowercase letters, numbers and a special character (like @ ! or *). To Log Off simply click the link "Log Out" located in the upper right hand corner of every Agora page right next to "Welcome, [your name]." The Agora is set to remember your password on that computer for up to one year. You may be logged out when you install new software or whenever AILA has to reboot its server. If you are using a public or shared computer, you will want to log out so that others cannot access your AILA information. Non-members can create an account on the Agora in order to purchase items. To create your account go to agora.aila.org and click "Log In" in the upper right hand area. On the next screen, on the right-hand side click the "Create an Account" button located underneath the "Create a Non-Member Account" header. Fill out the form on the next screen and click "Create an Account" to finish. Items are eligible for a full refund within 30 days of purchase provided they are in resalable condition and have all of their original packaging. Shipping and handling fees are not refundable. Bookstores may return unsold books up to 90 days after purchase. CDs are eligible for full refund within 30 days of purchase provided they are still in their original unopened condition. No opened products are eligible for return/refund. Shipping and handling fees are not refundable. All downloadable content purchases are final. They are not eligible for return/refund. No refunds will be given after a session has begun. Annual Conference: All cancellation requests must be made in writing prior to the Advance Registration Deadline. For registrations cancelled between the Early-Bird Registration Deadline and Advance Registration Deadline there is a $100 cancellation fee. All Other Conferences: All cancellation requests must be made in writing prior to the Early-Bird Deadline. There is a $50 cancellation fee for all cancellations. You can conveniently renew your AILA membership online via AILA Agora. If you are within 45 Days before your membership expiration date, or up to 90 days you will see a red "Renew Your AILA Membership" on the right navigation. If you have questions about your renewal please e-mail the Membership Department at membership@aila.org. An in-person conference is any conference where you must be physically present at the conference site. AILA National is responsible for the following in-person conferences: Annual Conference, Midyear Conference, Spring Conference, Fall Conference, Fundamentals Conference, two Topics Conferences, California Chapter Conference, and New York Symposium each year. All other chapter conferences are handled by the individual chapters and questions regarding these events should be directed to the chapter, including CLE inquiries. A webcast is a live streaming version of our in-person conferences. You are able to connect via the Internet and watch an in-person conference. Viewing consists of live video, the PowerPoint presentation (if the conference includes it), and a chat box. You will have the ability to ask a question using the chat box. An audio seminar is a teleconference. Participants dial in over the phone to hear the speakers' presentation and have the opportunity to ask a question live over the phone. A web seminar is an audio seminar with a web portion. Participants dial in over the phone to hear the audio presentation and to have the ability to ask a question, and also log on to a website to view the PowerPoint presentation. OnDemand programs are recordings of previously presented in-person conferences or seminars. They are available in CD-ROM and online, on-demand formats. Please note that some states do not allow CD-ROMs as a method for earning CLE credit. Please visit the AILA CLE Center to view information for your jurisdiction. A podcast is a short audio file that you can listen to on your computer or download onto your portable media player and listen to anywhere at anytime. This is a special member benefit and podcasts are available to members at no cost. Typically, podcasts are between 15-20 minutes long. Only podcasts that are 60 minutes or longer are eligible for CLE credit. These podcasts will be marked as special CLE podcasts. AILA's Annual Conference, held each summer, is an excellent opportunity for new practitioners. Not only is there a track specifically devoted to fundamentals in immigration law, attendees have the unique opportunity to design their own conference schedule, which can include fundamentals and more advanced topics in their interest area. Participants can also network with other new practitioners and experienced immigration attorneys from across the country. 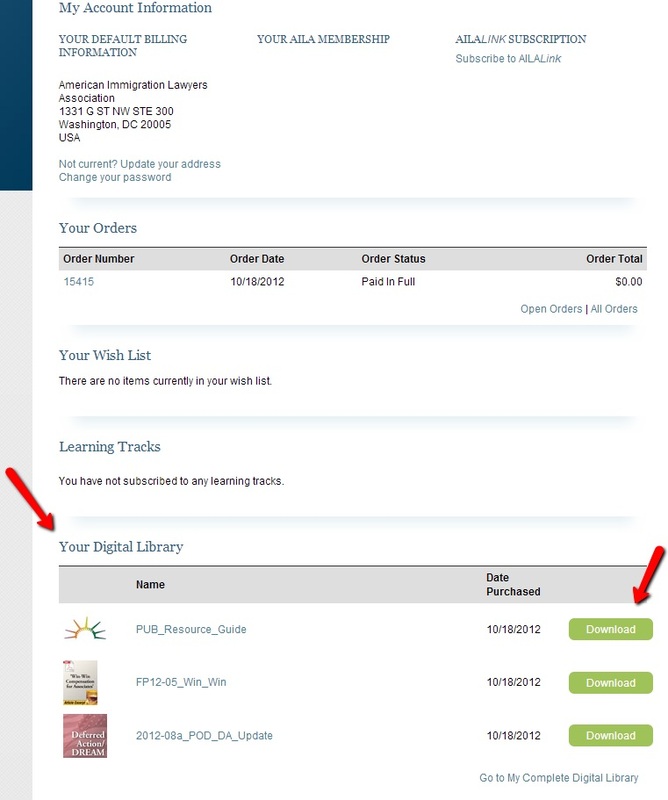 For other options, visit the Getting Started in Immigration Law Learning Track on AILA Agora. Conferences, seminars and webcasts all have easy online registration available. To register, click the checkbox next next to the registration field and then the "Add selections to cart" button on any upcoming event page. Follow the steps to checkout and you will have completed the registration process. If you do not wish to register online, print the registration form linked in the "Registration and Pricing" tab. Note: Conferences put on by AILA Chapters have separate registration requirements. Upon completeing your checkout you will receive a confirmation email that you have purchased a registration for that event. For an in person event, you just need to go to the event. For a seminar or webcast, you will receive a second email the morning of the event that will include call-in and online access instructions. AILA cannot verify attendance and participation in a program unless individuals register directly for the seminar and use your own telephone line to participate in the call. Therefore, at this time, AILA cannot verify the attendance of persons who listen in on a call as part of a group, and such persons will not be eligible for CLE credit. CLE credit for group participants will be available soon. Can I order recordings of AILA conferences / seminars / webcasts? Recordings of AILA conferences / seminars / webcasts are available for purchase as either CDs, downloadable files or links for online streaming (webcasts only). Search the Agora to find the content you are interested in and click the "Add to cart" button to begin the purchase process. For downloadable files and streaming links, an instruction file on how to access the materials is included in your download. In-person conference OnDemand is typically available within 1-2 weeks. Seminar OnDemand is available within 48-72 hours after the completion of a seminar. To access and download any digital goods/downloadable content, simply click on My Account at the very top of the page. From there simply scroll down to the section called "My Digital Library" (see image below). On there you will see the digital goods associated with your most recent purchases. To download a digital good simply click the green button labeled "Download" next to the digital good which you are trying to download. To see any digital goods/downloadable content from older purchases simply click on the "Go to My Complete Digital Library" link at the bottom of the page. PDF stands for Portable Document Format and is an industry standard that allows documents to be distributed across multiple computer systems and always look the same. To access PDFs you will need the FREE Adobe Acrobat Reader which is available at http:///www.adobe.com/ Once installed, any PDFs you click will automatically open in Acrobat for you. A zip file is a file format used for data compression and archiving. A zip file contains one or more files that have been compressed to reduce file size. Zip files are used on the Agora to allow the users a faster download and to only need to download one file instead of multiple files. How to I open a ZIP file? To access the content in a zip file you will need to unzip it. For every product that you purchase that contains a zip file you will also get a PDF with detailed instructions on how to unzip your files and play them. Yes, all AILA Agora digital goods will work on both Windows and Mac computers. There is a bug in Safari that causes it to append .html to the end of .zip files when you download them. There are 2 things you can do: either rename the downloaded file to remove the .html, or use Firefox web browser which does not have this problem. How do I remove or hide an item from my digital library? Click on the link Go to My Complete Digital Library under My Account. From there you will see a list of all your digital purchases. Simply click on the green button named "Hide" located to the right of the product you want to hide. To unhide items, scroll to the bottom of the page and click on "Show all digital goods". To return a publication, follow the instructions on the back of the packing slip included in your shipment box. Updates and corrections to published books can be found on the book updates page. Orders of 5 to 9 books are eligible for a 10% discount, orders of 10 to 49 books are eligible for a 15% discount and orders of 50 or more books are eligible for a 25% discount. To qualify for a bulk-order discounts, books must be of the same title and be delivered to the same address. 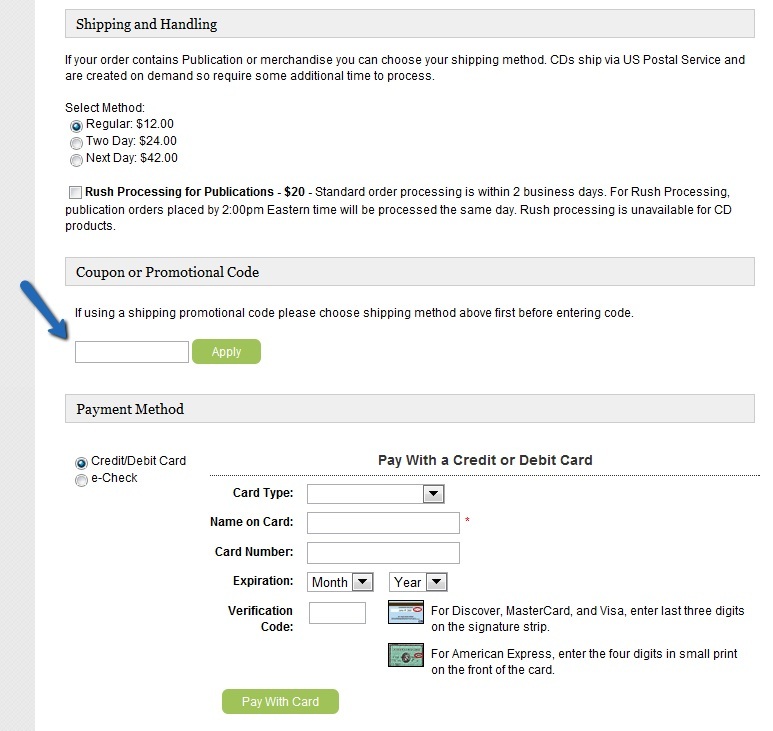 To use your promotional/coupon code, simply add the items you'd like to purchase to the cart. When you have finished shopping, click on your shopping cart and then on "Proceed to Checkout". Verify your shipping and/or billing address and the click "Continue". On the "Coupon or Promotional Code" section, enter your code and hit apply (See image below). Please make sure you have selected a shipping method before entering your coupon code. You can email us at agora@aila.org or call us at 1(800)982-2839. Our office hours Monday thru Friday, from 9:00AM to 5:00PM (EST).